Eagle Mountain was within the original Joshua Tree National Monument in 1936, but it was removed in 1950 to cater to the mining and steel industries. 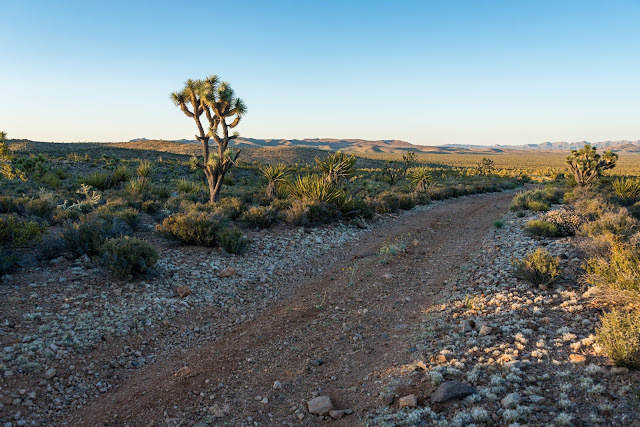 The National Park Service's consideration of restoring most of the lands to Joshua Tree National Park would bring more certainty that this wildlife habitat will be managed for conservation rather than profit. Joshua Tree National Monument was established in 1936 after a grassroots campaign led by Minerva Hoyt urged President Roosevelt to protect the beautiful desert wildlands that were threatened by human activity, including the mass removal of cacti for gardens and the ridiculous practice of torching Joshua Trees to guide motorists at night. 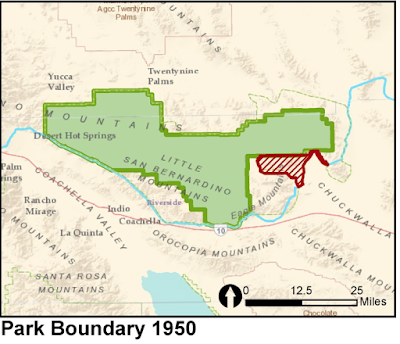 Joshua Tree National Monument boundary as established in 1936. The Eagle Mountain Area of current concern is highlighted in red. 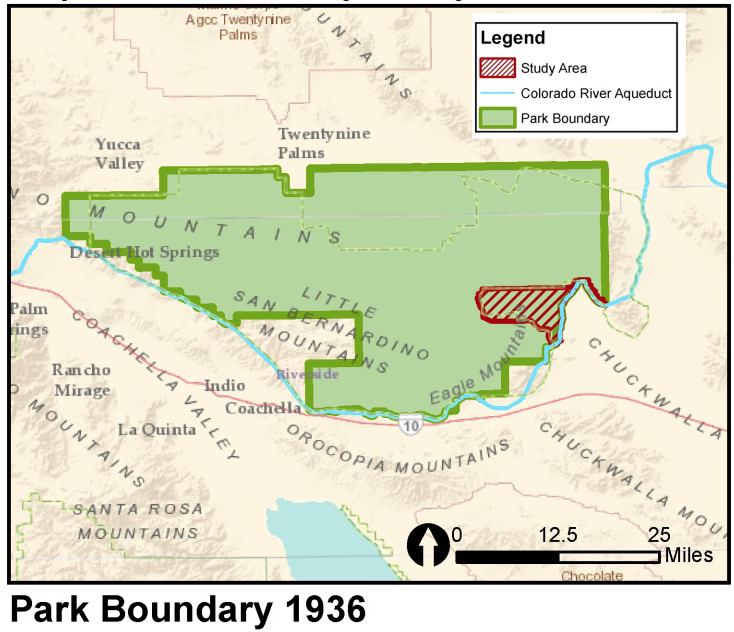 Map by the National Park Service. 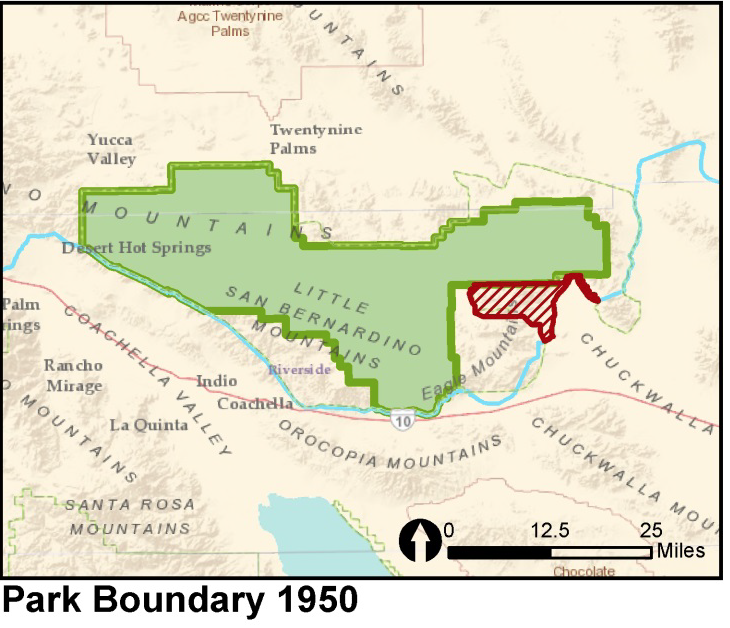 America's demand for steel forced the National Park Service in 1948 to grant conditional use permits to industrialist Henry Kaiser for the Iron Chief mine in what was then Joshua Tree National Monument. The Iron Chief mine was the smaller predecessor to the Eagle Mountain Mine. 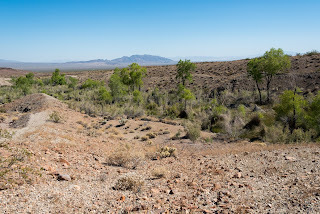 In 1950, Congress withdrew thousands of acres from the Monument to make them available for large-scale mining operations, including the Eagle Mountain Mine. The iron ore was sent to Kaiser's steel mill in Fontana, where processing resulted in significant air pollution. Congress eviscerated Joshua Tree National Monument with Public Law 81-837, making thousands of acres of the Monument available to mining. 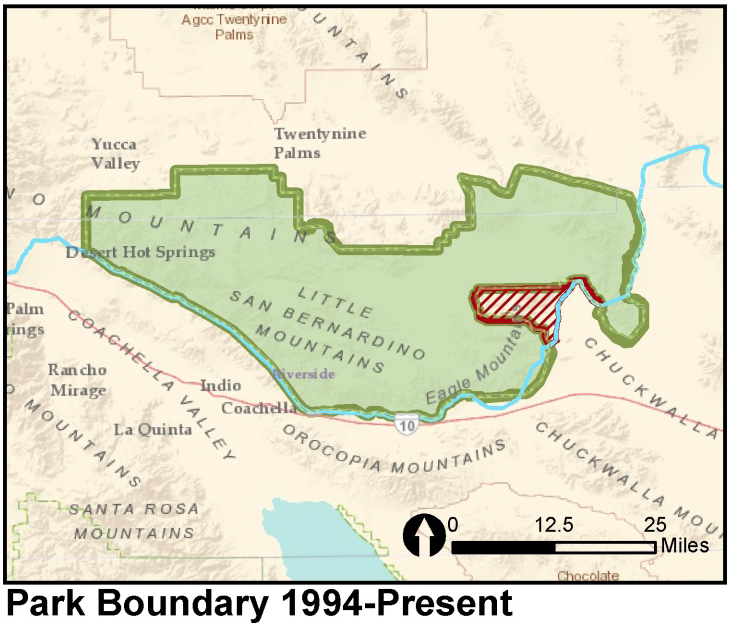 Map by the National Park Service. Competition from cheaper overseas steel and efforts to reduce air pollution resulted in the closure of Kaiser Steel mills in Fontana and the associated Eagle Mountain Mine next to Joshua Tree in the 1980s. In 1989, Kaiser proposed to turn the open pit mine into a giant landfill for Los Angeles, seeking to import thousands of tons of garbage by truck. The landfill would depend upon a land swap with the Bureau of Land Management. 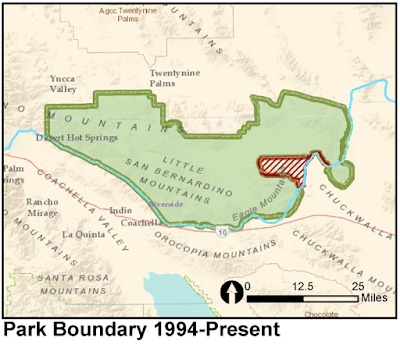 The California Desert Protection Act of 1994 established Joshua Tree as a National Park, and restored some of the lands originally taken from the Monument in 1950. But The Eagle Mountain landfill proposal prevented the return of the Eagle Mountain area to the Park. Map by the National Park Service. 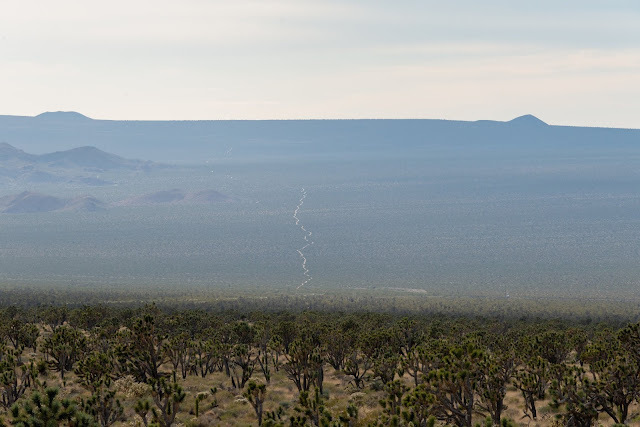 After nearly two decades of legal wrangling, Los Angeles dropped plans to send its trash to Joshua Tree in 2013. Kaiser Sells its mining claims to Eagle Crest, a company with another idea for the massive open pits of the old mine. The landfill proposal was not the end to the Eagle Mountain saga. After the landfill failure Kaiser sold its patented claims to Eagle Crest. The Eagle Crest company wants to build a hydroelectric pumped storage project on the mine. Another developer is proposing to build a utility-scale wind project on the Eagle Mountain lands that Congress removed from Joshua Tree in 1950, although that is not as far along as Eagle Crest. Eagle Crest's plan is to fill one of the mine's lower open pits with groundwater. When utility-scale solar and wind projects in the area generate excess clean energy that the grid cannot absorb, that energy would be used to pump the Eagle Crest water to another open pit at a higher elevation. When the grid needs that energy again, the water would flow back to the lower pit through turbines, generating hydropower energy. The project could use as much as 32 billion gallons of groundwater over its lifetime. This is a seemingly frivolous use of water in a parched area, especially considering that excess renewable energy production could also be smoothed out with battery storage and demand response. Although the National Park Service's proposed boundary change may not put an end to the Eagle Crest project, it would at least protect the surrounding wildlands that still serve as foraging habitat and corridors for wildlife. 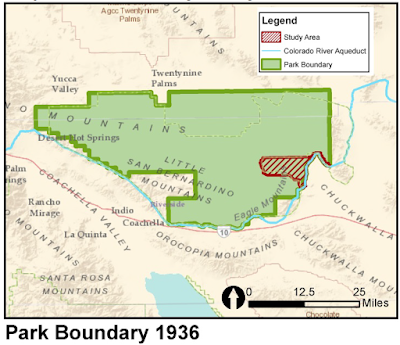 Below is a map of the National Park Service's preferred alternative for the adjustment of the Joshua Tree National Park boundary in the Eagle Mountain area.